Although you are copying an Old Master and placement has already been decided for you, here are some thoughts to keep in mind in the future when you begin composing your own work: if you leave a large space above the head, you will signal to the viewer that the person you are depicting is diminutive, whereas, with less space above, you will give the impression of a taller, more imposing figure. This knowledge is especially useful psychologically when you want to make a woman seem more feminine, or a man more masterful. For example, you would probably not want to paint a commissioned portrait of a farmer, a CEO, or a king, with a lot of space above their heads. 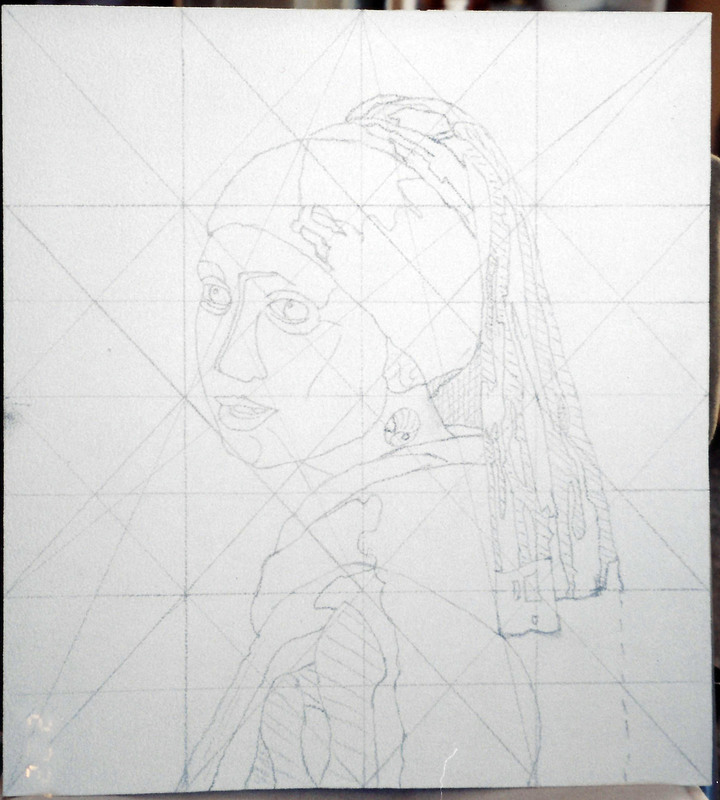 Drawing well requires an extensive understanding of proportion, so to help you get a headstart on drawing and line, we will adopt the OMs’ method of using a graph to facilitate a highly accurate enlargement of your chosen painting. Then, as you progress in skill and knowledge of the “rules,” you can begin to break them because you will find you need these guidelines progressively less and less. Now that you have collected your painting supplies and materials, it is time to do an acetate overlay cartoon, or line drawing, over your 8″ X 10″ reference. Then, you will transfer that same cartoon onto your painting board. Both the acetate AND the board will be gridded. Remember those algebraic equation days where what you do to one side of the equation, you do to the other side? Well, the same idea applies here: what you do to the acetate, you do to the board, no matter how short a guideline may be. Work from your grayscale reference from the grided transfer and cartoon, through to the rendering stages. When you “scale up” your reference material to fit your painting surface, the proportions of that reference material must be maintained; otherwise, you will have a final drawing that is out of proportion with perhaps ears too big or fingers too long. Here is an easy procedure to ensure you get it right. Let’s say you are working from an 10” X 8” photo reference, and you want to paint it as a 26” X 20”. c) decreasing the photo image content by leaving off a small bit of the sides. This would be a very slight adjustment and probably worth it to be able to maintain a more standard size frame. Once you have the correct proportions, use a thin-point red or blue Sharpie and draw a rectangle on the acetate that corresponds proportionately to the size of your board and place it over your drawing. Use pieces of masking tape to secure each side or corner. Very lightly draw a big “X” on your surface from corner to corner. Connect the cross around to make a diamond. Finally, divide the graph into fourths by adding two horizontal and two vertical lines. 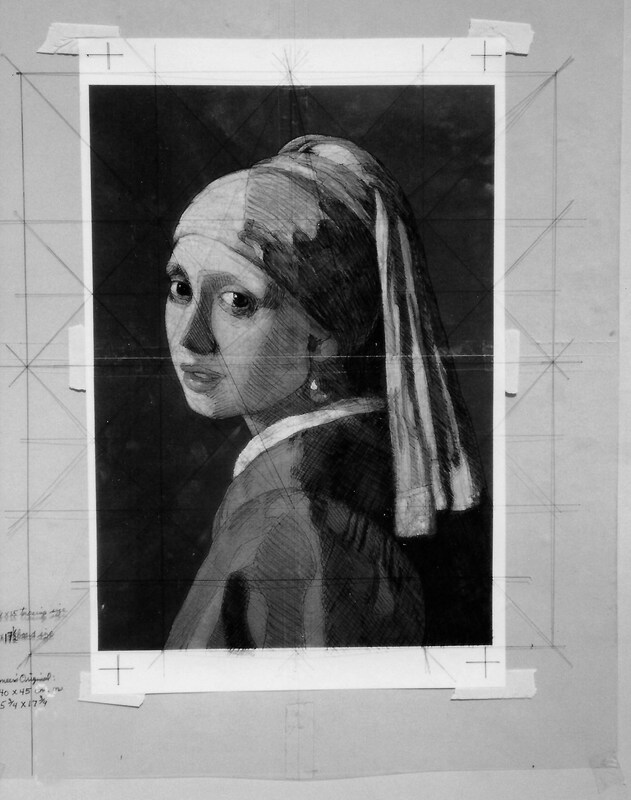 Lay another piece of acetate on top of the grayscale reference and grid. As with the gridded acetate, also tack this one down with tape. Trace the figure, including as many detailed features as possible. You can use dotted lines or denser lines to indicate shadows or clothing folds. If you make a mistake, remove it with alcohol and a cotton swab, as mistakes made at this stage will only look even more pronounced in your enlargement. Strive for perfection–it will pay off and save you time later on. *You can take your cartoon outline further, if you find it helps you, by turning it into a value study. Do this by continuing to draw on the acetate to create a value study with lines–closer together indicates darker–farther apart creates lighter areas. When your acetate drawing looks exactly like the reference and you would deem it a good drawing by itself, you are ready to begin transferring it to the painting surface. We’ll continue with inking and gesso/gelatin buildup in later posts. This entry was posted in art colonies, groups, Classical Academic system, composition, drawing, materials, Old Masters, painting process, painting surfaces, value, workshop and tagged art, draw, Education, Old Master, Paint, Sharpie, visual art, Workshops and Tours.